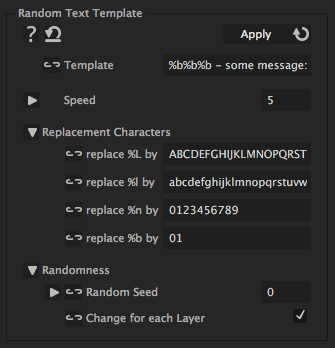 This iExpression replaces the source text of a text layer by a random text whose structure can be specified via a template. The template consists of fixed parts of the text as well as the place holders "%L", "%l", "%d", and "%b". The fixed parts remain unchanged in the generated random text whereas each occurence of %L is replaced by a random upper case letter, each occurrence of %l by a random lower case letter, each occurence of %n by a random number (0 to 9) and each occurrence of %b by a random binary number (0 or 1). Example: The template "Coordinates: (%n%n,%n%n)" can generate random texts like "Coordinates: (15,72)" or "Coordinates: (49,14)". is the template which the random text is based on. The random text is obtained from the template by replacing any occurrence of %L,%l,%b,%n by some of the below specified characters. The remaining parts of the template are kept unchanged. specifies by which letters any occurence of %L in the template will be replaced. Among the letters specified here, for each %L one is randomly chosen. specifies by which letters any occurence of %n in the template will be replaced. Among the letters specified here, for each %n one is randomly chosen. specifies by which letters any occurence of %b in the template will be replaced. Among the letters specified here, for each %b one is randomly chosen.